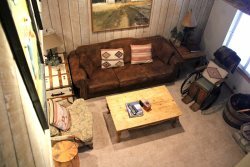 Nicely Upgraded One Bedroom & Loft & Two Bath Condominium in the Scenic Meadow Area of Mammoth Lakes. Sleeps up to 6 (approx. 1100 sq. ft). This spacious 2 story unit has vaulted ceilings and you walk up one flight of outside stairs to enter the unit. Corner unit is bright with lots of windows to let the light in and has a good view. The first floor is the Bedroom, Kitchen, Dining Room, Living Room and 1 Full Bathroom. The second floor is the Loft and the 2nd full Bathroom. The Loft is open to the living room by a half wall. There is 1 King bed in the Master Bedroom, the Loft has 1 Queen bed & 1 set of Bunk Beds. No sofa sleeper. There are 2 TV`s (New HD Flat Screens in the Living Room and in the Bedroom), and two DVD players. Wifi Internet access. I-Pod docking station. No phone in unit. This cozy unit is tastefully decorated with mountain cabin style furnishings and chefs will enjoy the upgraded and well stocked kitchen with stainless steel appliances. Upgrades also include newer carpet, slate flooring in the entry, kitchen and bath, and a granite counter top in the bath vanity. There are two outside parking spaces availalbe. Sunrise Condominiums offer a Spa, Seasonal Swimming Pool and Sauna. Coin-operated laundry facilities located in the common area near the office. COMPLIMENTARY INTERNET and CABLE TV are provided, however NO REFUNDS will be given for connectivity problems or Internet failure. TOT LICENSE 807-SR43. We have stayed in a variety of units at Sunrise over the years. This unit, SR43, was by far the cleanest, most comfortable, and best maintained unit we have stayed in. Our congratulations and thanks to the owners.